Professionally Speaking » Hey! Hey! LBJ! How many speechwriters did you kill today? Hey! Hey! 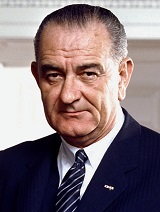 LBJ! How many speechwriters did you kill today? He worked a two-shift day, 7:00 A.M. to 2:00 P.M. and 4:00 P.M. to 9:00 P.M. Between 2:00 P.M. and 4:00 P.M. he took a walk, swam, ate lunch, napped, showered, and changed clothes. Then, returning to his office, he was known to say, “It’s like starting a new day.” Top assistants were expected to be available at all times, for both shifts. …a struggle to find the right balance in Johnson’s rhetoric…His insecurities and moods, skills as an extemporaneous speaker and deficiencies with a text, and his inability to adapt to television had push-pull effects on the speechwriting process. These difficulties were exacerbated by the President’s eccentricities, such as his habit of intimidating other men by showing off “Jumbo”– his masculine appendage, of which he was inordinately proud. Schlesinger reports that he interviewed speechwriter Douglas Carter by forcing him to join in a skinny dipping session in the White House pool. The pressure was crushing. Waking in the middle of the night, Hardesty would realize that he had been editing a speech in his dreams. A ceaseless week of drafting drove Goodwin to his physical and mental limit in the predawn hours of January 12, the day of delivery. At the end of a thrity-six hour jag, Goodwin could neither focus on his typewriter keys nor order his thoughts in complete sentences. Alas, even Jumbo was no help.